We’ve already established that Lloyd and I have no gardening skills.Â No green thumbs here, just Black Death thumbs.Â The only thing I can reliably grow inside is a philadendron, because they’re really, really, reallyÂ hard to kill.Â In the great outdoors, I only plant impatiens.Â Partly because I can remember theirÂ name, and partly because they’re what my mom always put in our front planters at the parsonage.Â Â They’re a hardy little plant, and I dump plenty of Miracle Grow on them so it’s like they’re on steroids.Â So, I give you the before and after.Â Hold your applause until the end, please, and no flash photos. Lauren, I loved growing impatiens in Delta. I CANNOT get them to grow in Eckert, -- not even with Miracle Gro! Yours look beautiful. I’m jealous! To be fair, they’ve only been in the pots less than three minutes in the picture. I’ll let you know how they’re doing in a couple of days. That’ll be the test! Are those plants shuddering? I could’ve sworn I saw them shudder. Yay! 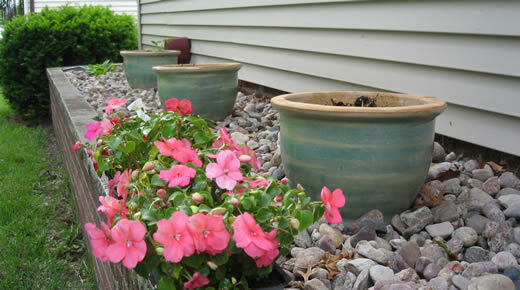 For impatiens in your pots. I love those pots. I’ve always felt like impatiens were my plant. Once, when I was very little, my mom took me plant shopping. I guess I was acting up a bit, being rather impatient. Mom got a flat of those and said they were for me -- impatiens for the impatient one. 🙂 So far they look great!